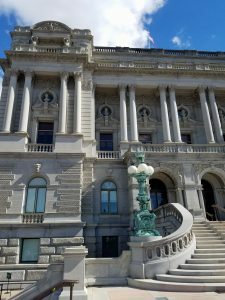 Last week, I published my work in progress. 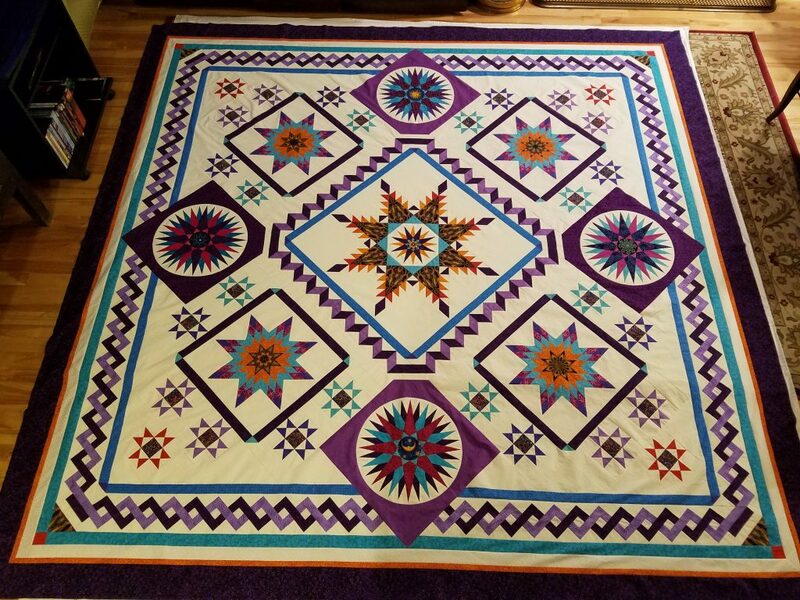 I’m proud to say that the quilt top, Luaret’s Stars, is now complete. This quilt was commissioned over 18 months ago and has been slowly evolving. 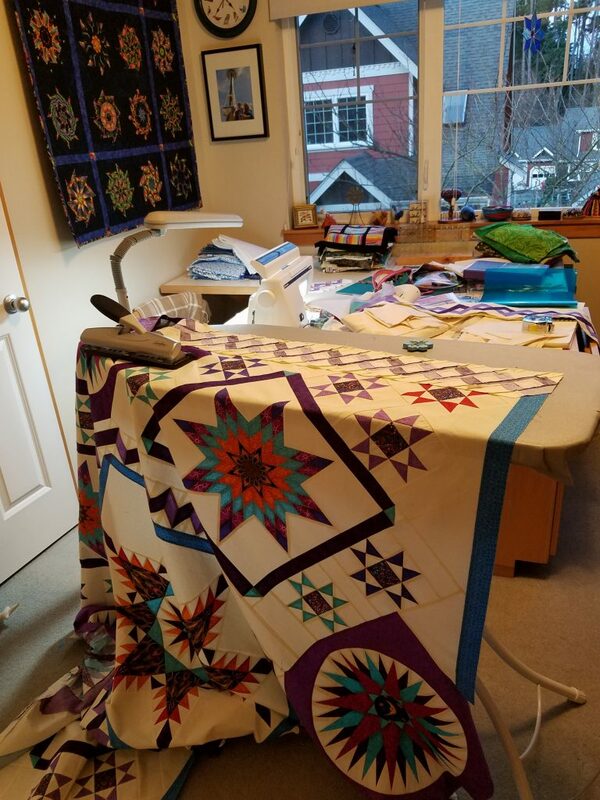 Last year I traveled extensively to teach and also spent a great deal of time helping to care for my new twin grandchildren, so I didn’t have much time to devote to the quilt. Fortunately, my client has been extremely patient and understanding. 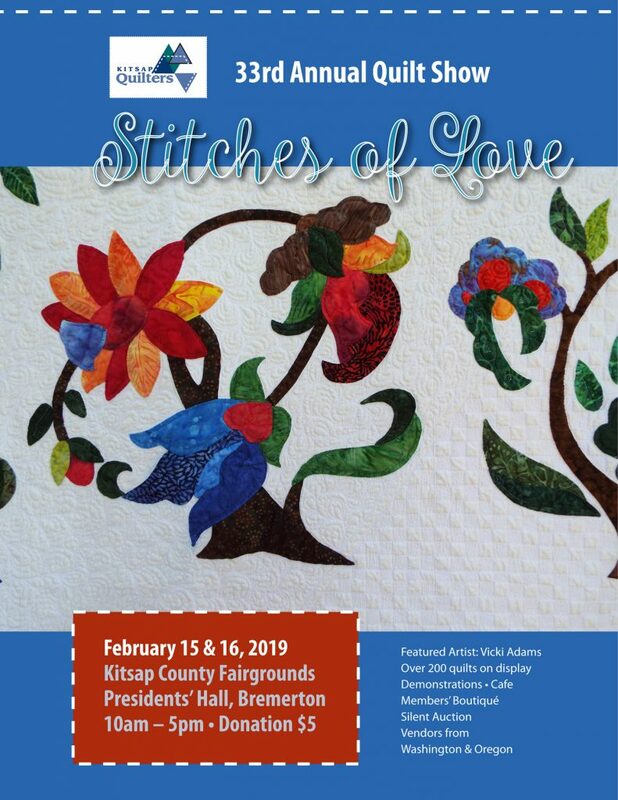 I’ve worked intensively on it over the last three weeks to finish in time for my machine quilter, Wanda Rains, to quilt it before our local quilt guild show in mid-February. Wanda now has it and is working her magic. I’m looking forward to seeing what she does and then I’ll have to scramble to execute the binding before the quilt show. Here it is, spread out on my living room floor. 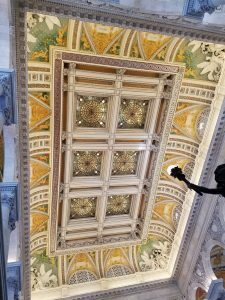 It took over 200 hours to piece and is 105″ x 105″, king-sized. 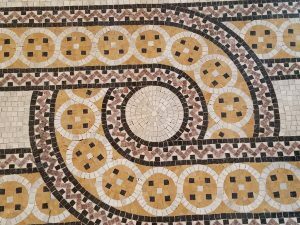 In my blog of 17th December, 2018 I posted a picture of my major project in progress. I have spent the last couple of weeks working intensively on this quilt top and am sharing the next stage with you. 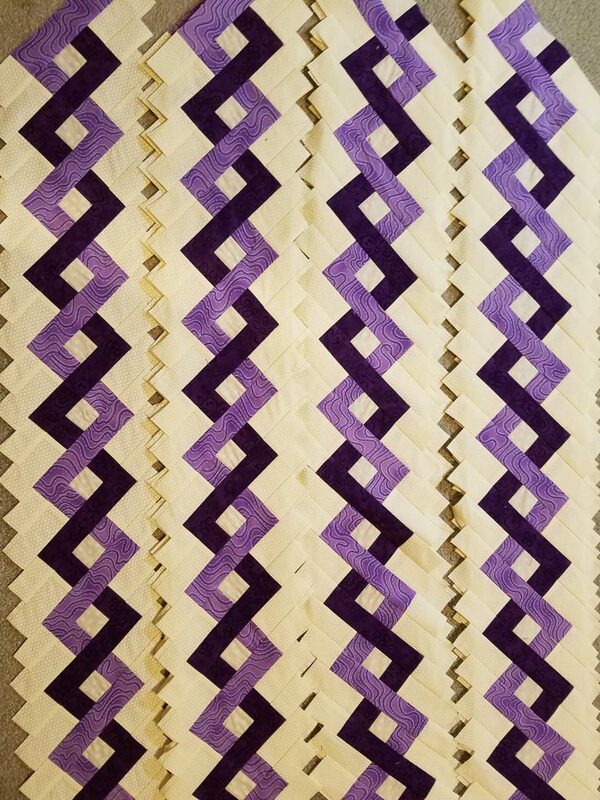 I constructed a pieced lattice for the next border. 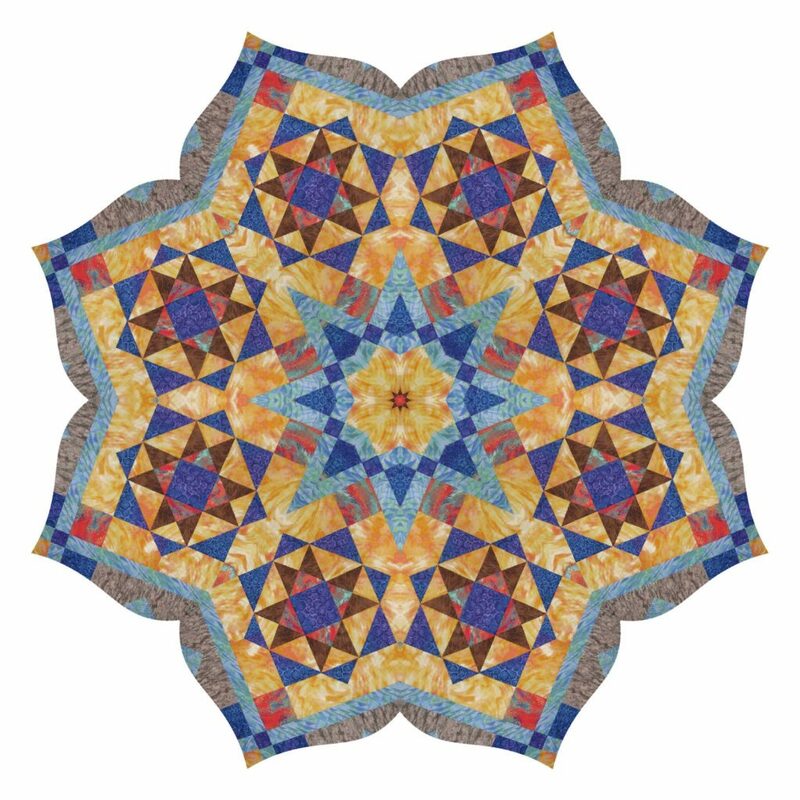 I made eight sections, two for each side of the quilt, mirror images to go on either side of the inset compass blocks. 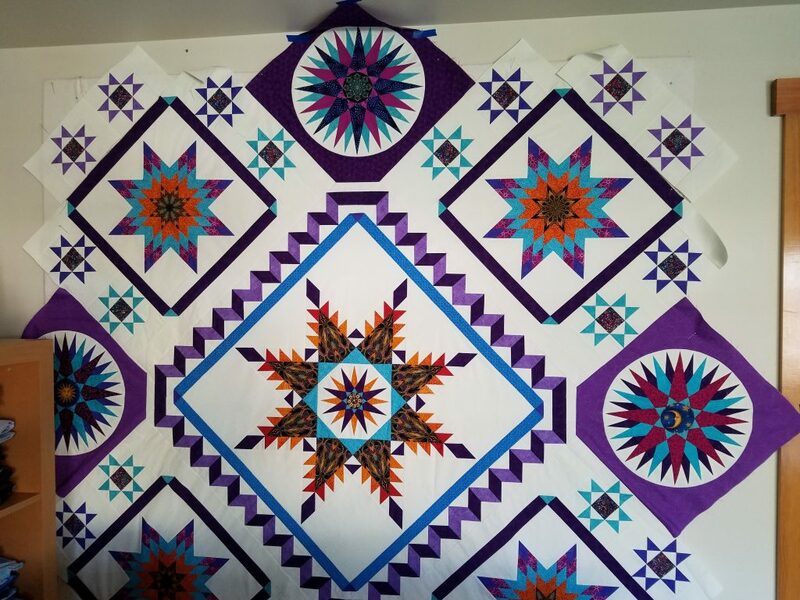 I like the scale of this new border and think it will work well for the quilt top. Here I’m wrestling with how to handle connecting them at the corners and am auditioning ideas. 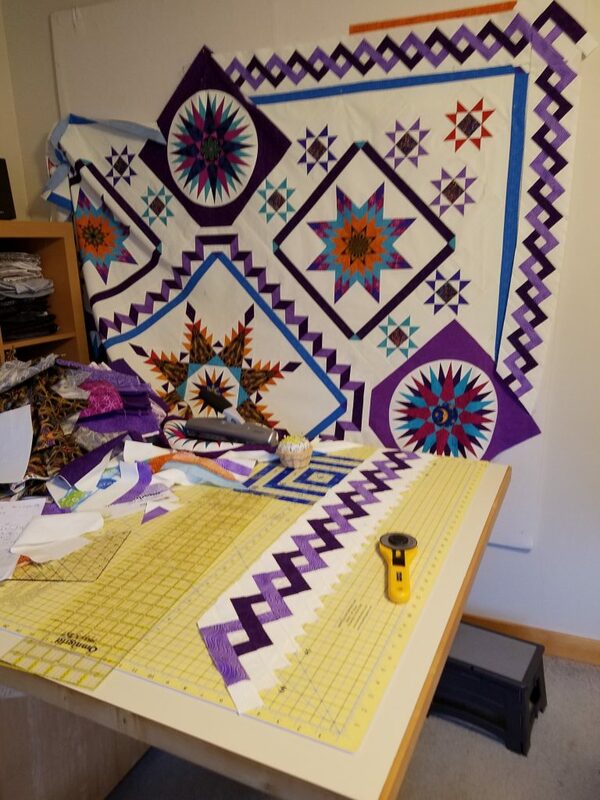 As you can see the whole quilt top became rather unwieldy and heavy for my work wall. When it came to pinning these border sections, I took the whole thing downstairs to my living room. I moved the chairs, vacuumed and put a large white sheet on the floor. Then I was able to lay the whole quilt top out, measure easily and work on the floor to pin. When it was time for ironing after the sections were attached by machine, I resorted to using a hole punch as a fabric weight to keep the top from slipping off and pulling! This project permeated every part of my house!. At one point, I had to call a time out to clear the surfaces in my studio. By next week, the top should be finished and I will post again. 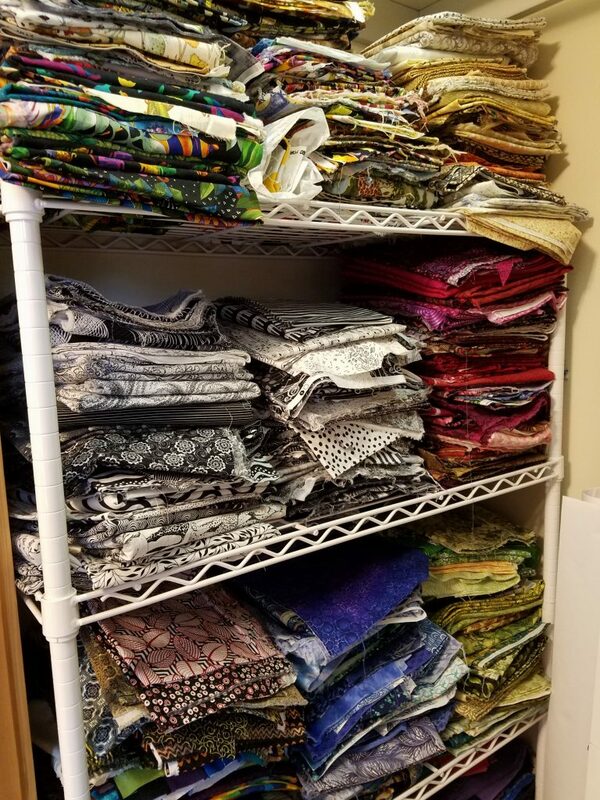 How do you organize your fabric stash? There are so many possibilities. The trick is to find a system that works for you, so that at any time you can locate the fabric that you want. Here are some ideas: by color, by project, by theme. I seem to use a whole combination of these. I like to use mono-chromatic prints, so I have piles of colors. I also have many multicolored fabrics, so there’s a stack of striped fabric and another with dots. I have floral prints, assorted animal prints, miscellaneous prints. The batiks are in a separate section, as I usually don’t mix batiks with other quilting cottons. I also have a different section for hand-dyed fabrics. Possible fabrics for my current project are strewn all over my cutting and sewing table until I’ve made my selections. They usually stay out because I never make all the decisions up front and my projects tend to evolve. Every now and then, I will stack them so that I have space to use my cutting table. One advantage of tidying up and sorting is that you can actually see what you have. I often come across fabrics that I had forgotten that I have, and I get excited and inspired. I try to tidy up after I finish a major project, or if I’m going away for a while. If my workplace is uncluttered, it is more enjoyable being in it and I feel more creative. Most of us have more than one project going at once, so there’s usually one of two piles of projects on hold, or new ideas. My studio doubles as my office, so there are bits of paper to contend with and I’m not always very good at keeping them all organized. Once I get into a project, I like to work pretty intensively, so the room gets pretty messy. Then, I’ll get frustrated by the chaos and have a go at cleaning up. 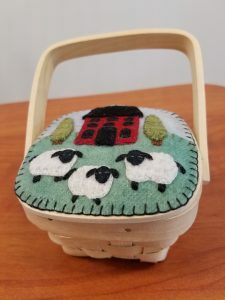 I’m fortunately to have a room to devote to my quilting and office needs. The storage places are utilized to the full, so if new stuff comes in, I really need to clear out some of the old stuff. I need to apply this principle to my clothing too…. This photo shows part of my current project which I’ve been piecing on and off for the last 18 months. My teaching schedule has been busy this year and I’ve had family commitments with the joys of twin grandchildren. Hence, progress has been slow. 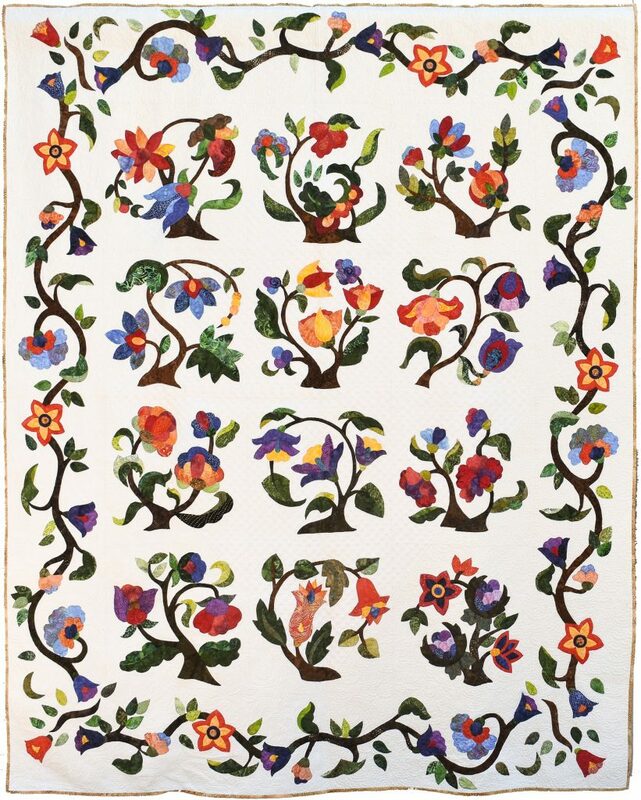 I’m determined to complete the top by the end of the year and have booked my long-arm machine quilter for January. The center is a 28″ Radiant Feathered Star with a 9″ compass in the middle. 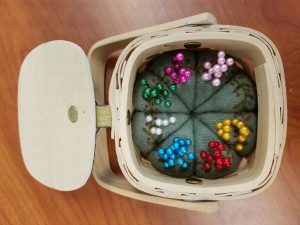 Then there are four 15″ compass blocks and four 14″ diamond star blocks. The 24 small Ohio Star blocks fill in the gaps. 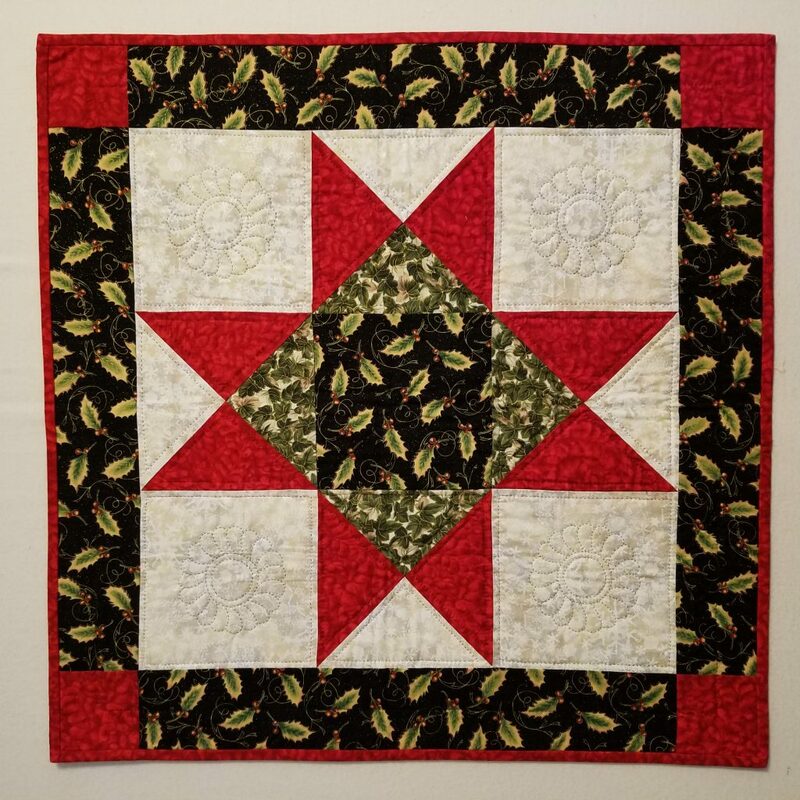 This quilt is a commissioned piece and fortunately, my client is being extremely patient with the length of time it’s taking me to design the quilt and get the job done. I’ll post on this again when the project is closer to completion. 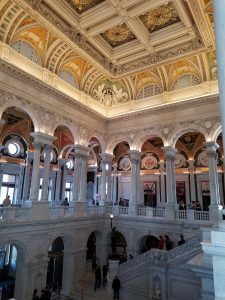 In October, I spent four days in Washington DC between two teaching engagements, one in Baltimore and the other in Newark, DE. 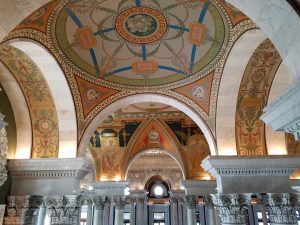 When I visited the Library of Congress Thomas Jefferson Building, first opened in 1897, I was struck by the abundance of color on the ceilings and walls, as well as the elegance of all the arches and domes. 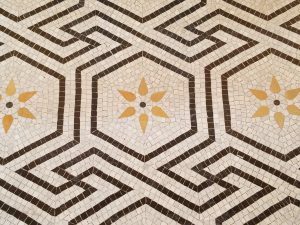 There were also patterns in mosaic on the floors. It was spectacular. 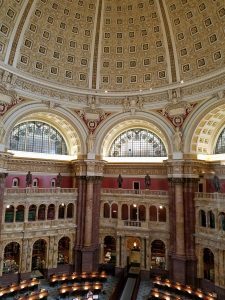 I find places like this inspiring and seeing them adds to my store of experiences from which to draw when I am designing quilts. 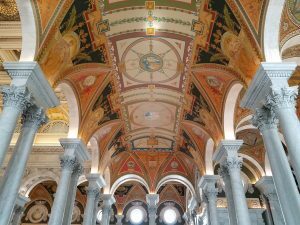 This is a place not to be missed if you have time in Washington DC. Here are some pictures.